Faswall Featured in Wine Business Monthly - ShelterWorks Ltd.
Faswall green building blocks were featured in the March issue of Wine Business Monthly, a trade magazine that serves wineries and others in the U.S. wine industry. Read the article by clicking this link and going to page 76 (you will need to create a free account to access the article). The article describes a wine barrel storage room built with Faswall green building blocks at South Seattle College’s NW Wine Academy. The architect, Joe Chauncey at Seattle-based Boxwood, chose Faswall because of many properties that make it great for wine barrel storage. The blocks resist mold or mildew that could harm the wine. They will not rot even in very humid conditions. Plaster can easily be applied to the side of the blocks, which makes walls easy to clean if there are spills. Faswall green building blocks can be cut with wood saws and take standard wood screws, meaning contractors don’t need special equipment to work with them. Chauncey and Regina Daigneault, the program’s wine technology coordinator, liked Faswall’s green building characteristics. It creates extreme energy efficiency structures that keep heating and cooling costs to a minimum. Faswall is made with 60 percent recycled materials, including recycled pallet wood and some recycled cement. Both parties agreed that Faswall also creates beautiful structures. The wine barrel storage room is inside the NW Wine Academy’s tasting room, and the exposed mineralized wood walls serve as conversation-starters inside the newly renovated space. Is your winery looking to build a new wine barrel storage room or any other structure on your property? Faswall is also great for foundations, commercial centers, homes and outbuildings. Do-it-yourself builders love how ease it is to use. 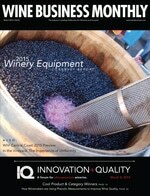 Contact us today to learn how we can help your winery meet its goals. Categories: Faswall for Wine Cellar Construction, High Performance Walls, ICF Commercial Buildings, LEED Certification Leave a comment ?